Adding These Spices Will Bring Your Bone Broth to Another Level - The Osso Good Co.
Are you making bone broth a part of your regular diet? Bone broth is an extremely nutrient-rich and versatile beverage that can be used in a variety of ways to boost your health. Bone broth can be consumed by itself as an alternative to coffee or tea, or it can be used in cooking to add extra flavor and beneficial nutrients to any meal. Try experimenting with it and adding herbs and spices such as turmeric, cinnamon, cayenne pepper, or ginger. Adding these spices will bring your bone broth to another level! Because bone broth is cooked for an extended period of time, it is rich in beneficial compounds such as collagen and gelatin, which make it a powerful tonic that helps improve digestion, heal intestinal damage, reduce inflammation, and build healthy tissue — including hair, skin, and muscles. The collagen and gelatin in bone broth also give it a thick, creamy consistency, which makes it especially satisfying and filling. Depending on the type of bone broth you select, it likely already contains certain herbs and spices that give it a comforting, savory flavor. For example, our Osso Good Organic Chicken Bone Broth contains garlic, parsley, thyme, peppercorn, and bay leaves. However, depending on your own needs and preferences, you may want to prepare your bone broth with additional spices for more flavor or beneficial properties. Try some of these suggestions to get more healthy herbs and spices into your diet! Turmeric, the yellow spice that adds color to curry, is well known for its powerful medicinal properties. Turmeric is naturally anti-inflammatory, which is incredibly important as many Americans are suffering from the damaging effects of chronic inflammation. Left untreated, chronic inflammation can disrupt many processes throughout the body, causing hormonal imbalances and metabolic disturbances, and increasing the risk of many degenerative diseases, including heart disease and cancer. Curcumin, the main active ingredient in turmeric, has been found to be just as effective as some anti-inflammatory drugs, without causing any undesirable side effects. However, curcumin is poorly absorbed into the bloodstream. It helps to combine it with black pepper to increase its absorption. Curcumin is also fat soluble, which means it’s a good idea to include a source of dietary fat in your meal. Try a bone broth-based curry recipe that includes chicken, coconut oil, and coconut milk (all good sources of fat), along with spices such as turmeric and coriander, for a flavorful and satisfying meal. Cinnamon is another popular spice that can be used in a variety of recipes. Like turmeric, cinnamon is anti-inflammatory and can also have a powerful effect on blood sugar levels. Studies have shown that cinnamon helps improve insulin sensitivity and lower blood sugar following the consumption of carbohydrates. This may make it particularly beneficial for people with diabetes or prediabetes. Try a hearty Moroccan lamb tagine, which combines bone broth with cinnamon, cayenne pepper, and ginger — all of which offer powerful health benefits. Cayenne pepper contains a compound called capsaicin, which may help combat certain types of cancer. One study found that capsaicin inhibited the development of prostate cancer cells in mice. Another study showed that capsaicin increased energy expenditure in healthy men, helping them burn more fat. Cayenne pepper can be added to a wide variety of soups and stews to give them a little extra kick. Try it in this easy-to-make sweet potato soup! In addition to being anti-inflammatory, ginger can also help treat nausea. This includes nausea caused by motion sickness, morning sickness, or chemotherapy. If you’re feeling queasy, try a soothing Thai carrot soup made with ginger, cinnamon, turmeric, and cayenne for a powerful medicinal boost. 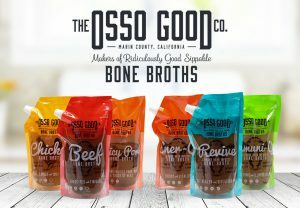 At Osso Good, we make bone broths and paleo soups with organic ingredients that are nutrient dense, gluten free, dairy free, Whole30 Approved, and Certified Paleo. We are very proud to make our own bone broth in small, controlled batches to ensure the quality is always consistent and the taste is always amazing. Copyright © The Osso Good Co. 2017 • All rights reserved.